Digiscoping 101: What is it, and how does it work? Digiscoping is taking photographs with a digital compact camera through the eyepiece of a telescope. This method wasn’t – as you might believe – developed by photographers, but was discovered accidentally by nature observers. The development of high-quality compact digital cameras since the late 90s makes it possible to take high-class pictures through high-end telescopes using quite a simple technique. The main aim is in “freezing” and storing wonderful moments, which have previously “only” been observed through a scope. Easy documentation of different species is just as important an application. Thanks to long focal lengths (high magnification factors) it is also possible to photograph sensitive species from a great distance without disturbing them, or to take close-up photographs of distant objects that are difficult to reach. With a great deal of practice, some test runs and time spent studying the theory in depth, it will also be possible to take exceptionally sharp images in a quality which comes close to images taken with expensive professional photography equipment (SLR cameras with tele-converters). Why is digiscoping so interesting? Added value for your telescope: not just viewing but taking photographs too. Quality images of very distant subjects. No need to buy film ever again – storage media is reusable. Images can be checked and enjoyed immediately after capture. No loss of quality when copying and transferring data. Editing images later is easy. Prints can be produced and photos sent via email immediately. 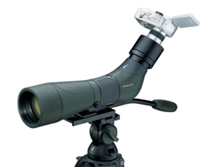 A telescope scope has the basic function of bringing a magnified image to the observer’s eye. Light enters the large objective lens at the end of the scope and comes out through the eyepiece as a round column of light called the exit pupil. It is this column of light that the camera will be photographing so it must be centred exactly over the light column or a condition called vignetting or shadowing, which spoils the picture, will occur. The digital camera mimics the human eye to a certain extent in this manner.